One of the dominant trends in personal computing at this time is the mini pc. Whether for use as an everyday computer, as a component in a home entertainment system, or as an in-car computer... small is definitely in. The Maxtop CSX-001 Mini PC Chassis is a Micro-ATX format case, complete with three case fans and a 200 Watt power supply, that may be of interest to people looking to follow the trend and lose their behemoth tower cases. I have noticed a recent increase in the popularity and availability of Maxtop products, but in case you are not familiar with them, the Maxtop Technology Corporation is “is one of the leading PC and Rackmount chassis manufacturers in the world“. In addition to their complete line of cases, their product line is rounded out with associated items such as: power supplies, keyboards, mice, and modding supplies such as led fans and cold cathodes. The CSX-001 was provided for review directly from Maxtop, but if you are looking for one of your own, they are available from several reputable online retailers, including: Newegg for $45.00 (US) plus $10 shipping, or Dealsonic for $49.00 (US) with free shipping (Prices as of 05/22/03). The CSX-001 arrives double boxed, a feature many high end cases advertise to let you know that your investment will be protected in transit. Once you remove the outer box, you still have the carton as pictured in the two images above. If you’re planning on traveling with this PC (LAN parties, perhaps? ), you may want to hold onto this inner box... it has a carrying handle and is sturdy enough to support a completed PC with all the necessary components installed. With the case removed from the two boxes, you still can’t have a look at the CSX-001 due to the foam/plastic packing materials providing even more protection. I haven’t even seen the product yet, but I am already impressed. The first impression based on the packing alone tells me this isn’t going to be a cheap-o case! With the suggested price of $52 in my head before the review even began, I was not anticipating high end features. At the same time, I’m hoping that the packaging isn’t the only thing to provide a pleasant surprise. Finally removed from all of the packing materials a first glimpse of the CSX-001 is achieved. Its quite an attractive unit, with a two-tone silver/grey finish and chrome accents. For size comparison purposes I have pictured it next to a standard mid tower ATX enclosure (coincidentally another Maxtop unit I already owned) in the above right image. Obviously not as small as some of the mini-ITX enclosures out there, it is significantly smaller than the mid-tower ATX case, and I would best describe it as having about the same footprint as a VCR, but about 2-3 inches taller. 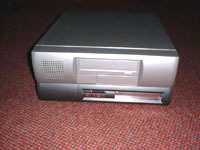 What looks like a pre-installed cd-rom drive in the image on the right is actually a “stealth” bay cover that should allow any optical drive to function normally while hidden behind the matching silver face. I will show more details of this feature during the installtion portion of the review, but basically the drive door area hinges open under the force of the optical drive tray, and the button pictured moves to operate the button on the face of your drive. In the image on the right, and shown in more detail below, are the power button, reset button, power led, and hdd activity led. The power and reset buttons are oversized chromed surfaces that have a solid feel to them when pressed. In general I am not a huge fan of chrome on a pc, but these buttons complement the style of the case nicely, and don’t seem like your standard, flimsy accessory. 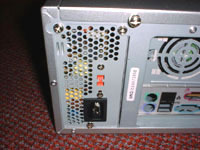 The mounting of the power led and hdd activity led is quite unique, as they are actually embedded behind the rectangular, clear plastic area pictured on the below right, one on either end. When illuminated they will create an unique glowing effect. 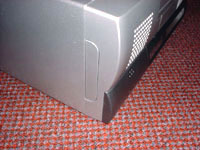 On the left hand side of the front panel you have a perforated area to allow airflow to the 80mm intake fan, a spring-loaded door to access the media connections, and another spring-loaded panel just around the side of the front panel. By pushing in this panel, you create a handle with which to remove the front face for “tool-less” access to the drive bays (which I will document later). Behind the sping-loaded door concealing the media connections you find a headphone jack, microphone jack, and two USB connections. As with everything else I have noted about this case so far, the door over the media connections is solid, and of higher quality than I perhaps anticipated. 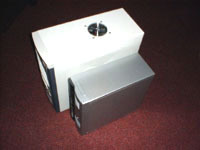 The back of the case features two (2) 60mm exhaust fans mounted above a standard ATX backplate. 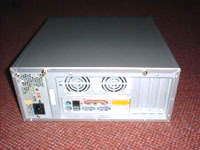 The 200 Watt power supply is pre-installed and due to its size, does not have a cooling fan on its external surface (one 80mm fan is mounted internally to cool the psu). 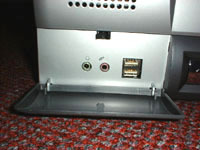 Access to the case internals is achieved by removing the top cover, which is held on by chromed thumb screws. Although a simple item, the inclusion of thumb screws here (and elsewhere inside the case) is another example of the quality and attention to detail that have gone into the Maxtop CSX-001.